Citation Information: J Clin Invest. 2018;128(7):2894-2913. https://doi.org/10.1172/JCI96640. Radiographic contrast agents cause acute kidney injury (AKI), yet the underlying pathogenesis is poorly understood. 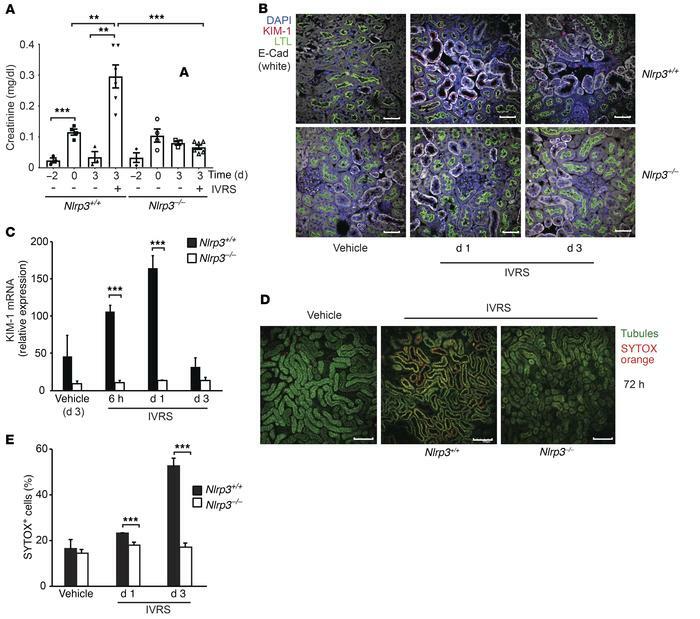 Nod-like receptor pyrin containing 3–deficient (Nlrp3-deficient) mice displayed reduced epithelial cell injury and inflammation in the kidney in a model of contrast-induced AKI (CI-AKI). Unexpectedly, contrast agents directly induced tubular epithelial cell death in vitro that was not dependent on Nlrp3. Rather, contrast agents activated the canonical Nlrp3 inflammasome in macrophages. Intravital microscopy revealed diatrizoate (DTA) uptake within minutes in perivascular CX3CR1+ resident phagocytes in the kidney. Following rapid filtration into the tubular luminal space, DTA was reabsorbed and concentrated in tubular epithelial cells via the brush border enzyme dipeptidase-1 in volume-depleted but not euvolemic mice. LysM-GFP+ macrophages recruited to the kidney interstitial space ingested contrast material transported from the urine via direct interactions with tubules. CI-AKI was dependent on resident renal phagocytes, IL-1, leukocyte recruitment, and dipeptidase-1. Levels of the inflammasome-related urinary biomarkers IL-18 and caspase-1 were increased immediately following contrast administration in patients undergoing coronary angiography, consistent with the acute renal effects observed in mice. Taken together, these data show that CI-AKI is a multistep process that involves immune surveillance by resident and infiltrating renal phagocytes, Nlrp3-dependent inflammation, and the tubular reabsorption of contrast via dipeptidase-1. CI-AKI is dependent on Nlrp3. WT (Nlrp3+/+) and Nlrp3–/– mice were treated with vehicle control or ioversol (IVRS) and assessed at 1–3 days. (A) Renal function as determined by serum creatinine (day 3, Nlrp3+/+ vs. Nlrp3–/–, ***P = 0.0001, n = 6/group, ANOVA). Volume depletion demonstrated an effect on serum creatinine (ref. values 0.04–0.08 mg/dl) (Nlrp3+/+, day –2 vs. day 0, ***P = 0.001, n = 3–4/group, ANOVA), but it returned to baseline on day 3 (Nlrp3+/+ day 3, no IVRS vs. IVRS, **P = 0.0023, n = 3–6/group, ANOVA). (B) Fixed kidney tissue was analyzed for tissue injury using KIM-1 (red). Images were taken with a fluorescence confocal microscope. Labels: nuclei, DAPI (blue); tubules, LTL (green); E-cadherin (E-Cad; white); KIM-1 (red). Image is representative of 3 independent experiments. Scale bars: 50 μm. (C) Real-time PCR for KIM-1 mRNA expression (Nlrp3+/+ vs. Nlrp3–/–, 6 hours: ***P = 0.0005, day 1: ***P = 0.001, n = 3–5/group, ANOVA). (D) Cellular injury in Nlrp3+/+ and Nlrp3–/– mice determined by multiphoton intravital microscopy and SYTOX positivity of kidney TECs. Image is representative of 3 independent experiments. Scale bars: 200 μm. (E) Quantitation of SYTOX-positive cells at indicated time points (Nlrp3+/+ vs. Nlrp3–/–, day 1: ***P = 0.001, day 3: ***P < 0.001, n = 7–15/group, ANOVA).